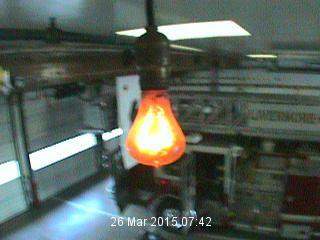 The Centennial Light Bulb Cam is at 4550 East Avenue, Livermore, California, where it is maintained by the Livermore-Pleasanton Fire Department. Why is it there? To constantly monitor the bulb which has been alive since it was first screwed into it’s socket at the fire station in 1901. The bulb had, however been manufactured by the Shelby Electric Company 6 years prior and used by the Livermore Power and Water Company until they closed and the bulb was given away to the Fire department. It wasn’t until 1972 that a reporter called Mike Dunstan discovered and proved the bulb’s history. The bulb has been monitored ever since. Moving only one more time, this event was given a blue light run to the new site and accompanied by a certified electrician to prevent failure. Have a watch of the strangely hypnotic webcam.